• Collecting the 1985 Topps Garbage Pail Kids Series 1 Sticker Set – Definitely Not ’80s "Garbage"
• 1952 Topps Wings – A Vintage Set Starting to Take Flight? Barring injury, Bryce Harper should have many productive years ahead of him. We have seen his ups and downs early in his career, but this is expected from such a young athlete. 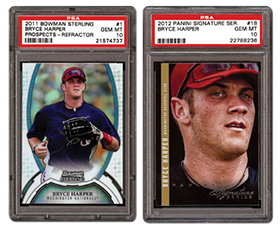 In the following article, we take a look at the player and some of his early cards as collectors size up Harper’s potential in the long run. 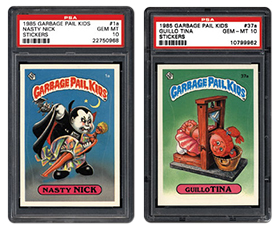 Collecting the 1985 Topps Garbage Pail Kids Series 1 Sticker Set – Definitely Not ’80s "Garbage"
For those of us who grew up in the hobby during the 1980s, there were few non-sports sets that could rival the popularity of the inaugural Garbage Pail Kids set in 1985. After the ultra-popular Cabbage Patch Kids hit their stride in the doll market, the hobby had some fun with these off-the-wall collectibles. 1952 Topps Wings – A Vintage Set Starting to Take Flight? The 1952 Topps Wings trading card set was one of many great non-sports issues produced during the 1950s. At 200 total cards, completing this set is no tiny task. 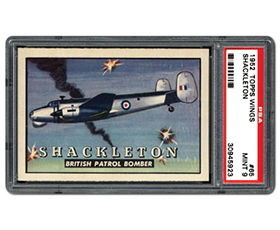 The set, which features colorful artwork, captures aircraft from various nations and it remains one of the more eye-appealing releases of the decade. In 20 years, whose collectibles do you think will be the most desirable of these current, young MLB sluggers? The PSA Set Registry staff will be at the upcoming Long Beach Expo Coin & Collectibles show. 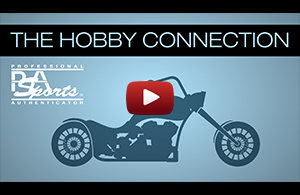 Last week, an email was sent to all Set Registry members for an exclusive Early Entry Pass. So if you’re looking for something special, or an upgrade to your set, chances are you’ll find it (and more) at the LBE. 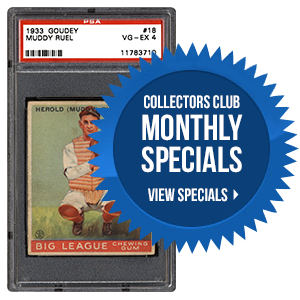 New to the PSA Set Registry is the Young Collectors Category. This is where kids, who are participating in the Long Beach Treasure Hunt and receive PSA graded cards, can build their own sets. This set is exclusive to cards obtained from Pirate Dave. Be sure to stop by the Set Registry booth and we’ll show your kids how to create and update their Treasure Hunt sets. For more information on the Long Beach Expo, please click here.